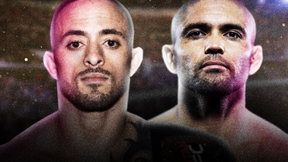 Fight Nights Global 59 from February 20, 2017. 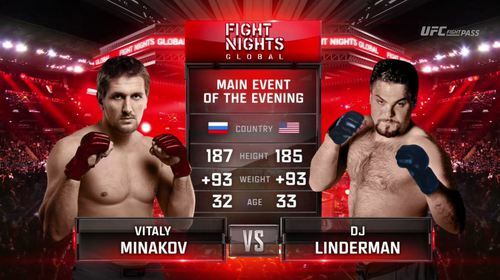 Vitaly Minakov vs DJ Linderman EFN 59 Feb 20, 2017 (37:27) Vitaly Minakov vs DJ Linderman at EFN 59 from February 20, 2017 in Moscow, Russia. 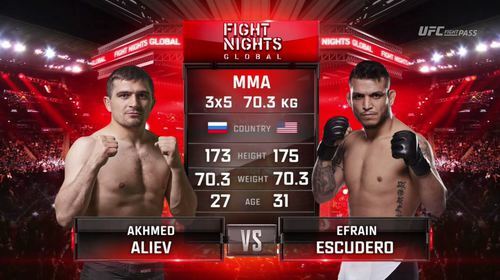 Akhmed Aliev vs Efrain Escudero EFN 59 Feb 20, 2017 (43:33) Akhmed Aliev vs Efrain Escudero at EFN 59 from February 20, 2017 in Moscow, Russia. 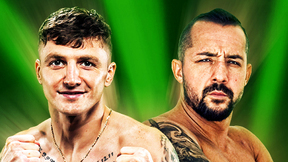 Tomas Deak vs Alexander Yanishev EFN 59 Feb 20, 2017 (24:09) Tomas Deak vs Alexander Yanishev at EFN 59 from February 20, 2017 in Moscow, Russia. 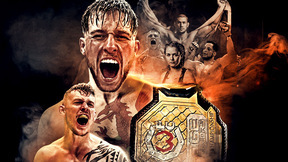 Toman Kopylov vs Artem Shokalo EFN 59 Feb 20, 2017 (26:46) Toman Kopylov vs Artem Shokalo at EFN 59 from February 20, 2017 in Moscow, Russia. 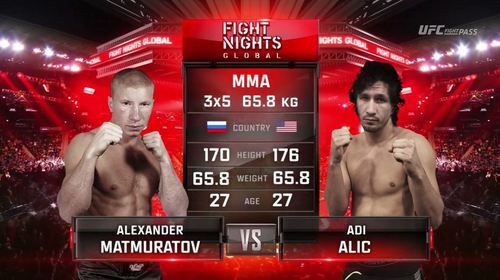 Alexander Matmuratov vs Adi Alic EFN 59 Feb 20, 2017 (31:46) Alexander Matmuratov vs Adi Alic at EFN 59 from February 20, 2017 in Moscow, Russia. 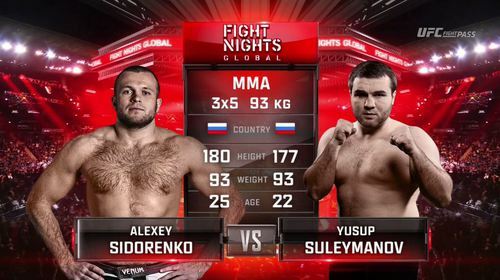 Alexey Sidorenko vs Yusup Suleymanov EFN 59 Feb 20, 2017 (26:37) Alexey Sidorenko vs Yusup Suleymanov at EFN 59 from February 20, 2017 in Moscow, Russia. 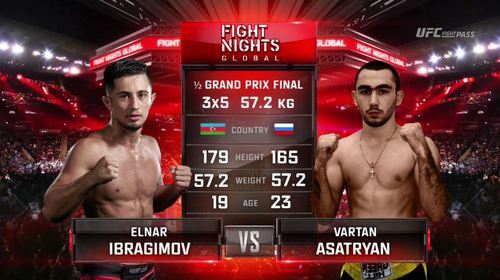 Vartan Asatryan vs Elnar Ibragimov EFN 59 Feb 20, 2017 (14:22) Vartan Asatryan vs Elnar Ibragimov at EFN 59 from February 20, 2017 in Moscow, Russia. Kurban Omarov vs Joaquim Ferreira EFN 59 Feb 20, 2017 (17:00) Kurban Omarov vs Joaquim Ferreira at EFN 59 from February 20, 2017 in Moscow, Russia. Nariman Abbasov vs Artur Zaynukov EFN 59 Feb 20, 2017 (24:06) Nariman Abbasov vs Artur Zaynukov at EFN 59 from February 20, 2017 in Moscow, Russia. 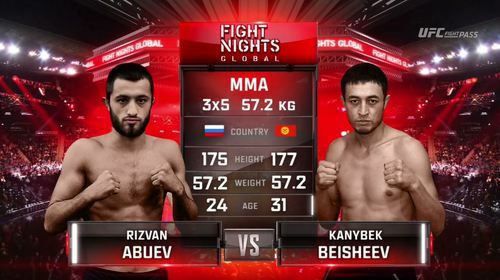 Rizvan Abuev vs Kanybek Beisheev EFN 59 Feb 20, 2017 (11:08) Rizvan Abuev vs Kanybek Beisheev at EFN 59 from February 20, 2017 in Moscow, Russia.